You probably remember Composition Notebooks from school. While they used to have only one design – a marbled black and white cover – they come in all types of shapes and sizes these days. 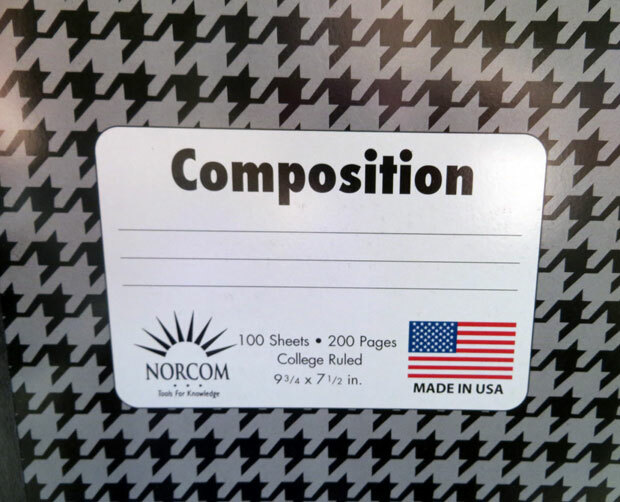 I purchased my Composition notebooks at Wal-Mart. because I’m a bargain shopper 🙂 It’s best to stock up during back to school sales. but they are only like 94 cents regular priced so it won’t break the bank too much! The important thing about choosing a composition notebook for altering is making sure it has sewn pages. Most do, but I’ve seen ones that don’t so be sure to check! PVA Glue (Regular Elmer’s will work also) or Gel Matte Medium I started using gel matte medium in mine – which works really nicely- but I was going through a lot of it so switched to Elmer’s white glue – can’t really tell too much a difference between which pages used the gel matte medium and which ones used Elmer’s – so use whatever your budget allows for and you prefer! A big fat craft “Popsicle” stick or a credit card: I used a jumbo sized craft stick for smoothing pages down and spreading the glue around on my papers – an old credit card/gift card would work well too. Old Scrap Paper for Thickening Pages: The original pages in a composition notebook are very thin. We want to thicken them up a bit, so you’ll need some sort of paper to cover each page with. I used a combination of old book pages and some leftover scrapbooking paper – but you can use pretty much anything! Newspaper can also work well this – I’ve also seen some people use pages out of the phone book in some other tutorials I’ve seen. Just use whatever you have handy and don’t worry about buying any supplies.. Optional Supplies: Hole Punch, Ribbon – to tie the book closed. 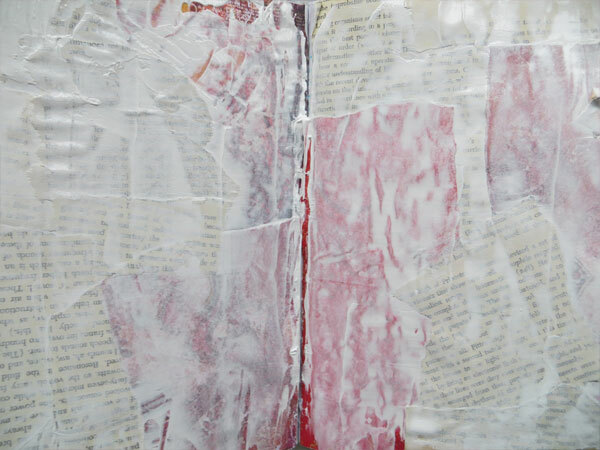 Gesso – to cover the pages before you start creating in the journal. Step 1: Begin by ripping out every other page. You’ll find once you reach the half way mark the pages you already ripped one half from will come out very easily. Then, start back at the beginning and rip out every 2-3 pages again. It’s up to you really how many pages you want your journal to have. I’ve found about 30-35 (for a total of 60-70 pages if you count the front and back) is a good number – not too bulky or intimidating to finish! Be sure to save the pages you ripped out – they can be used later as journaling blocks and I will definitely be using them in the junk journal tutorial I’m planning in a few weeks! Once your pages are ripped out, you’re ready for the sticky gooey fun part! 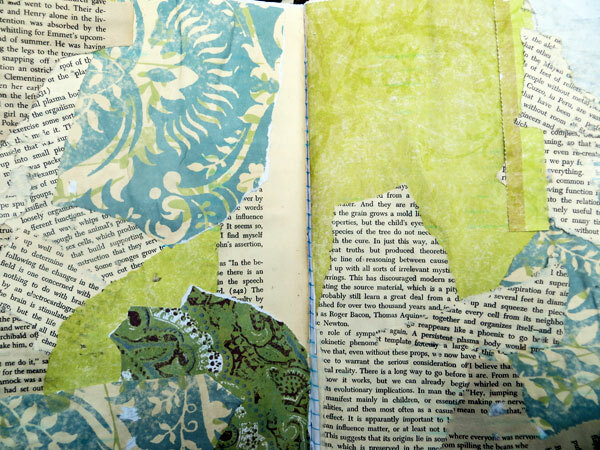 I like the shabby collaged ripped effect – you can make this as neat or as messy as you’d like! 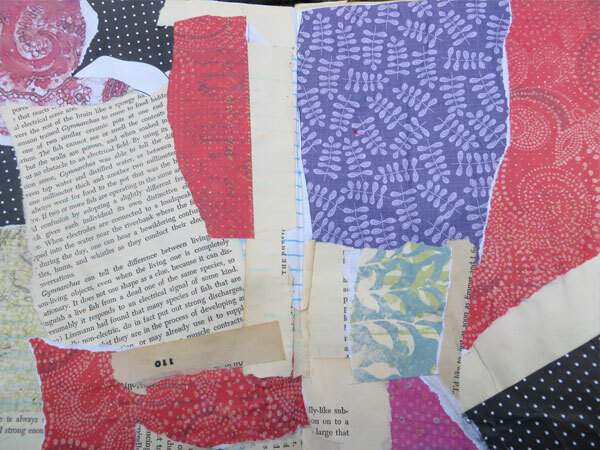 I started by just ripping out pages from a couple of old books I had (one I am planning on altering and would be ripping pages out of anyways) – as well as tearing up pieces of the scrapbook paper. I did my pages very haphazardly – if you prefer something neater or cleaner, you can cut out paper strips to the exact dimensions of the book and glue them down that way, or you can cut out squares, rectangles, circles, etc. etc. The only real limit is your imagination! I used a jumbo craft stick to spread the glue around on the papers before sticking them down, and then pressed the jumbo craft stick against the papers to flatten them out and get rid of any air pockets. This seemed to work really well and I didn’t have to worry about ruining any brushes! You’ll see some of my pages are still a little wrinkly…that’s OKAY! My journal here is going to be about letting go and to stop trying to be perfect about everything, so I think the wrinkles add to the story I plan to tell as well as add some really nice texture. You’ll notice I didn’t go all the way to the center on some of these – that’s okay! Nothing a little gesso and/or washi tape can’t fix. 🙂 Tip: Use wax paper in between pages as you are working on them so they don’t stick together while drying! Just look at the texture here! I used a credit card to spread the gesso, again because it’s terribly hard on brushes. I can’t wait to start creating over this awesome background! 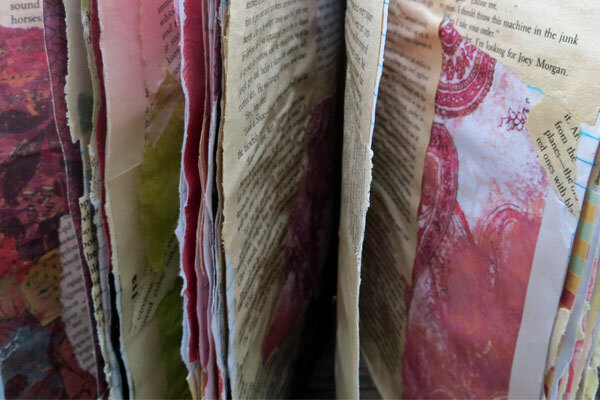 If you want your pages to show through more of the collaged background – just use plain craft paint, as that will be a little more translucent and not cover it up as much as the gesso. And don’t feel like you have to use the color white either – use any colors you want! I usually do the cover absolutely last because it is inevitable I will splash paint all over it at some point (I am very clumsy, lol) – the cover can be done in the same way we thickened the pages, or you can cover with gesso and paint over it. The cardboard covers on these composition notebooks are not real thick or high quality – so you may want to cover with paper first and then paint over it – plus adds lots of fun layers to your work! When my journal is complete, I am going to take a hole punch (or a screw punch if you have one of those!) and poke a hole on the front and the back cover of the journal to tie a ribbon so it stays shut. You can also use rubberbands to achieve this – that works just as well also. I can’t wait to start creating in this altered composition notebook journal and will be sure to post some more photos of the project as I complete more pages! I hope you enjoyed this little tutorial on making an altered composition notebook art journal – and if you have any different techniques or tips you’d like to share I’d love to hear them! And if you make a composition notebook journal – please do share your project in our Facebook Group – I love seeing everyone’s work! This is an amazing tutorial. I have an old composition book that I’d love to alter…will be adding this to my art to-do list! 🙂 Thanks! This is a great tutorial. I found you through Pinterest. I have extra composition books laying around since we always buy extras at back to school time. Even that one little line about using wax paper between pages is like a little gem to me. I kept wondering how you could do more than a page or two at a time without everything sticking together. Thanks so much for this! I’m off to check out the rest of your blog. i am obsessed with you blog!!! such an inspiration!!!! I’m very enthused to start some art journal projects. I’m also a writer & craft teacher to little ones. I’m always looking for projects that allow me to blend my interests. Thanks. I love this tutorial but I have a suggestion for a change. Instead of ripping pages out, use a jumbo glue stick or gel medium to glue pages together into groups of 4-5 pages. This adds strength to the pages but can also add a little bulk once you start gluing in scrapbook paper. I tend not to glue in a lot of paper to my journals ( I do mostly stamping or painting) so that works perfect for me. So glad I found your site! Thanks Julie! If you like thick chunky journals then keeping in the pages is definitely an option! That is one of my fav. things about art journaling – there are no steadfast rules, lol. 🙂 I like ripping them out so it’s not quite so bulky, but gluing them together definitely does work! Yeah, so you totally inspired me to convert a comp notebook into an art journal. 🙂 So far, I’m just gessoing the pages, not ripping any out and not gluing them together. I like that they are strong but floppy, but they’re just a bit too floppy, like vinyl, so I think I’ll try your idea of collaging paper scraps on them first and then splodging on some gesso. You inspire me to do what I haven’t got to yet, prepared the book by tearing out pages, now to start the “spit n paste”! Thanks, youre a star. Does Gesso make the pages thick enough so that one doesn’t have to add extra paper if they don’t want to? I am new to art journaling but love to find new techniques that I can easily incorporate into my learning. I’ve attempted a few pages but my problem is that once I gesso a page and let it dry the pages curl up. No matter what I do to them afterwards I just cannot get them to lay flat. Is there a tip you or anyone else would have for me? I sure would appreciate it. Thank you.